Every time I make Fuska, I get amazed with my daughter’s word such “Fuska is the best street ever” or “it is so addictive that it is hard to stop having Fuska”. But I know that we all know that. I got at least hundred comments about Talmakhana. Talmakhana is a must ingredient to make fuska. It is hard or kinda impossible to get it in abroad. But it is hard to live without fuska for Bangladeshi people. 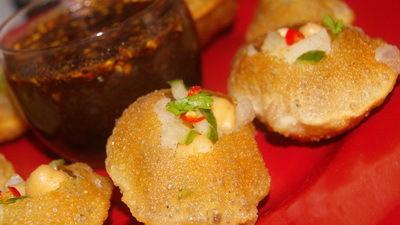 Fuska Without Talmakhana is Indian version of fusk which is called panipur or golgappa. With lots of love thanks again and don’t forget like my facebook page or join my facebook group to keep in touch with me. 1. Mix baking powder, flour and semolina together. Add water in it and don’t add all water together. 2. Dough needs to hard and knead well. Wrap it with dump cloth or cling wrap and let it sits for 20-25 minutes. 3. Knead it again and divide into 3 balls. 4. Roll each ball with flour and cut with cookie cutter. 5. Fry fuska on media heat other fuska will not be crisp. 6. Follow my Fuska post for stuffing and tamarind water. 7. Enjoy stuffed fuska with tamarind water. 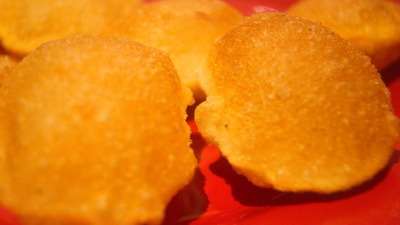 Tips:If fuska is not crisp enough, preheat oven 100˚c and heat fuska on try for 10 minutes. It will take out excess water from fuska and you will get perfect crisp fuska. semolina is called suji in Bangla.please buy fine one. Hi,Rownak.how r u?many many thanks for giving fuska recipe without talmakhna.what is called talmakhna in english? Most welcome. Talmakhana is called Astercantha in English. But I think that it is nt available in abroad. Hi, thanks for your recipe. Can you please specify – 1 cup equal to how much? আচ্ছা আপু Asteracantha মানে আমরা যেটাকে তিল বলে চিনি ওইটা নাকি? Thanks Rownak for your recipe.. .. I am your Indian friend…. 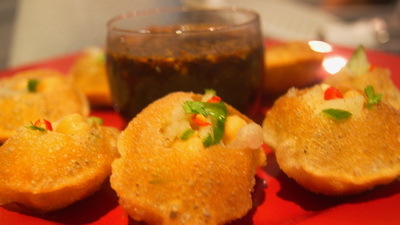 I tried your Fuchka recipe @home nd got appreciation.. .. All the credit goes to you. .